When I have leftover chicken on the weeks I make a Roasted Chicken or Sticky Spicy Honey Chicken, this is my go-to meal. You can serve it with rice (like we did) or with any kind of grain like bulgur, quinoa or barley. Feel free to exclude grains if you have food allergies/paleo and simply replace the grains with lettuce greens. 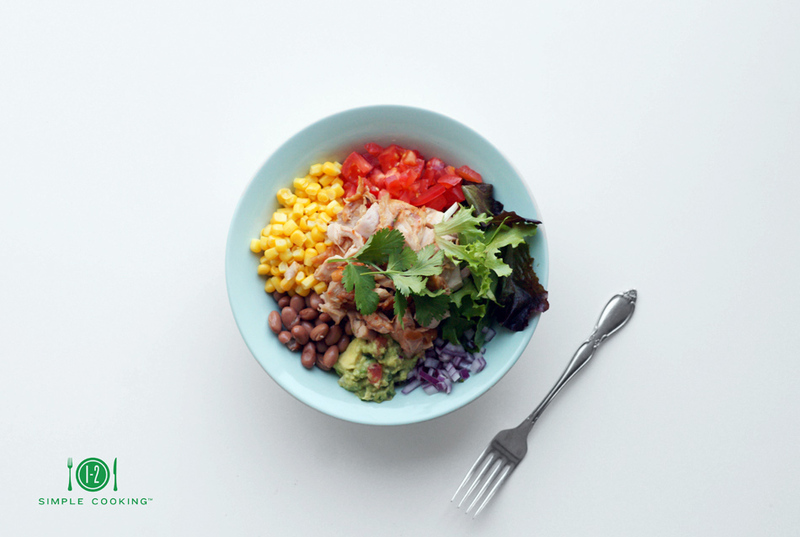 You can add any kind of vegetables to your burrito bowl and you can even change it up with the seasons -- Spring: throw in some radish slices or fresh peas! Summer: juicy luscious tomatoes, squash ribbons, fresh corn. Fall: roasted carrots, beets, brussels sprouts. Winter: Squash, kale, or cauliflower. 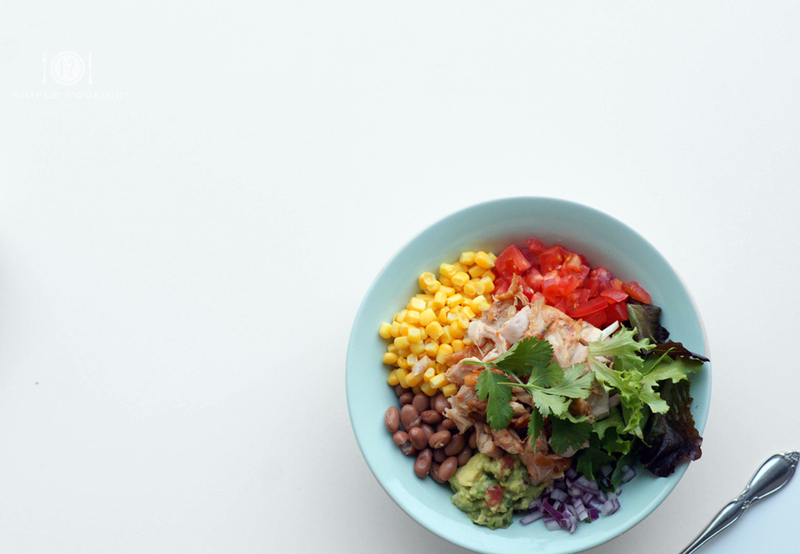 In a large bowl, place the rice/grains/salad greens on the bottom and top with chicken, frozen corn and beans. Place in the microwave for 2-3 minutes until thoroughly warmed. Continue arranging ingredients, adding the diced onion, tomato, lettuce, cilantro and guacamole. Feel free to finish off with hot sauce and a squeeze of lime. If you are not planning on using the rest of the beans anytime soon, empty the remainder of the beans in a small pot of boiling water for a couple minutes. Drain. Place the drained beans in a glass storage container and immerse in water. Beans can last in the fridge for up to 2 weeks, be sure to change out the water in between. If you have any leftover ingredients in this recipe, you can also use them for Vegan Nachos, Steak Tacos, or a Veggie Wrap. You can also view some of the videos for these recipes here! Show us your creations on our&nbsp;Instagram, FB and Twitter page -- we’d love to see what you guys come up with! Just use #onetwosimplecooking to follow along. And be sure to subscribe to our 1-2-Simple Cooking YouTube channel to stay up to date on our recipes and tips!